I’m back with another Disney themed DIY. My sister-in-law used to make tons of ribbon flip flops and they always turned out so cute. She made some for me when we took a trip to Disney a few years ago and for my first baby shower with Wyatt. I’m making these for Delilah in a Disney theme for our upcoming Disney World vacation but if you change the color scheme you could make them for any occasion or outfit. Even tweens and teens can make these ribbon flip flops with a little help from an adult. I have to give a shout out to my sister-in-law because she is one of the craftiest people I know. She throws amazing birthday parties for my niece and comes up with amazing crafts for every occasion. I was always into art and creating but never quite knew how to harness my talents until I met April. She was making and selling things long before me and if it weren’t for watching her turn her creativity into something useful I may never have started my blog or my shop! 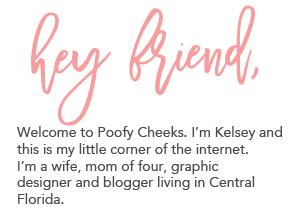 Combining my web design knowledge, ambition and my passion for creating with the hands on crafts I saw April make it fueled me to where I am now. Since these flip flops are something April used to make I have to give the credit to her for this DIY. Start by double knotting the ribbon around the thong of the flip flops. I usually cut the pieces off the ribbon spool as I go and alternate the ribbons. If you are using a printed ribbon try to tie the knots so that the print is facing up on both sides instead of facing down. This is where you need adult help or supervision. Once you have knotted the ribbon around the thong of both shoes trim up any overly long ribbons or really frayed pieces. Then use a lighter to quickly run across the ribbon and seal it from fraying. If you are using a small lighter like I did beware that it gets hot. Embellish the inside of the flat bottle cap with a circle piece of paper or sticker. Since my sticker was a bit bigger than the bottle cap I pushed it down and around the edges. Then I used an exacto knife to slowly cut around the edge and peeled the excess sticker off. Once it was trimmed I added an epoxy sticker onto each bottle cap. Use a hot glue gun to glue the bottle cap onto the thong of the sandal where the two sides meet. I can’t wait for my little lady to wear these around the park. I made them to match a Minnie themed outfit I have planned for her to wear. 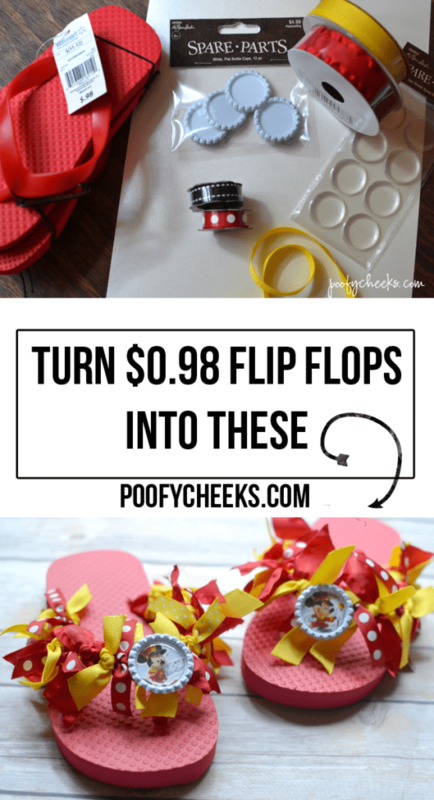 How do these $1 flip flops look now! ?